Tanks, helicopters and soldiers force Gazans to flee their homes before destroying them - buffer zone evacuation meets no criticism. Arab residents of Gaza were rounded up by armed soldiers and forced to flee their homes, which were promptly exploded in impressive plumes of dust and sand - but the soldiers were Egyptian, and there has been no international criticism of the buffer zone Egypt is establishing by force on the Gaza side of the Sinai border. 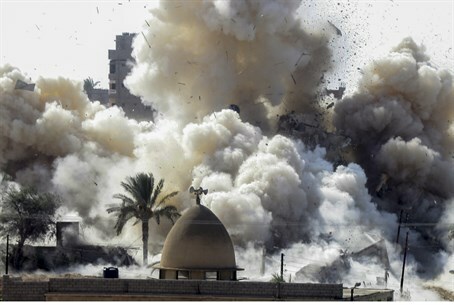 In the buffer zone plan, Egypt is seizing and evacuating all homes and farmland up to 500 meters (over 1,640 feet) into Gaza, all along the 13 kilometer (over eight mile) border. Additionally, a channel with a depth and width of 20 meters (over 65 feet) will be dug along the Gaza border. The expulsion is in fact being sped up, after the Egyptian army said Saturday night it discovered hundreds more smuggling tunnels into Sinai from satellite imagery, reports the Arabic-language Sky News as cited by Yedioth Aharonoth. As of last week, 200 families living in the buffer zone area defined by Egypt had accepted a financial package to compensate their abandonment of their homes, but 680 more families were still refusing. Video uploaded on Saturday shows the expulsion in full steam, as Egyptian tanks and helicopters can be seen over a Gazan town. Armed soldiers go house-by-house and residents flee with all of their belongings loaded into cars, before cranes knock down their homes and explosions rend the air. The Egyptian move follows two lethal terror attacks two weeks ago on Friday, in which at least 31 Egyptian soldiers were killed in El-Arish in the Sinai by a suicide bombing and a shooting attack. Egyptian sources revealed last week that Hamas terrorists had provided the weapons for the attack through one of its smuggling tunnels under the border to Sinai; the attacks were conducted by Ansar Bayt al-Maqdis jihadists, members of a group sympathetic to Islamic State (ISIS). Egyptian President Abdel Fattah al-Sisi justified the expulsion by citing the attacks, which led him to declare Sinai in a state of emergency, and insisting "Egypt is fighting a war of existence." Despite the fact that Hamas terrorists aim to destroy Israel, IDF actions to defend Israel from attack such as in the recent counter-terror operation have been met with a tidal wave of international criticism - the Egyptian expulsion of Gaza has been met with no such condemnation so far. Egypt has been cracking down on Hamas, in recent months banning the Muslim Brotherhood offshoot and implementing a siege on Gaza. While Egypt has deployed troops to the Sinai to fight the rampant jihadist terrorism in the region in coordination with Israel, concerns remain that the Egyptian disarmament of the peninsula as part of its peace agreement with Israel may be in danger of collapsing altogether, posing a potential military threat to Israel.